Henry Lee "Specs" Meadows (July 12, 1894 – January 29, 1963) was a professional baseball player. He was a right-handed pitcher over parts of 15 seasons (1915–1929) with the St. Louis Cardinals, Philadelphia Phillies and Pittsburgh Pirates. He was the National League wins leader in 1926 with Pittsburgh. For his career, he compiled a 188–180 record in 490 appearances, with a 3.37 ERA and 1063 strikeouts. Meadows played on two National League pennant winners with the Pirates (1925 and 1927), winning the 1925 World Series. He opposed future Hall of Famer Walter Johnson as the Game 1 starting pitchers of that '25 Series. He finished 0–2 in two postseason appearances with a 6.28 ERA. Meadows currently ranks sixth in Pirates history with a .629 winning percentage. 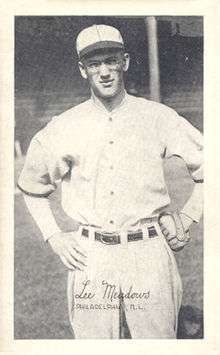 Meadows was one of the few players in the early 20th century who wore glasses in the field, earning him the nickname "Specs." He was born in Oxford, North Carolina and ldied in Daytona Beach, Florida at the age of 68.